Holidays can be hard. God used this verse to minister to me in a special way a few years ago. Life was dark. I was about to be extinguished. People who said they were helping just heaped more condemnation. I tried harder, it got worse. The future seemed dismal. If they gave up on me, would God? 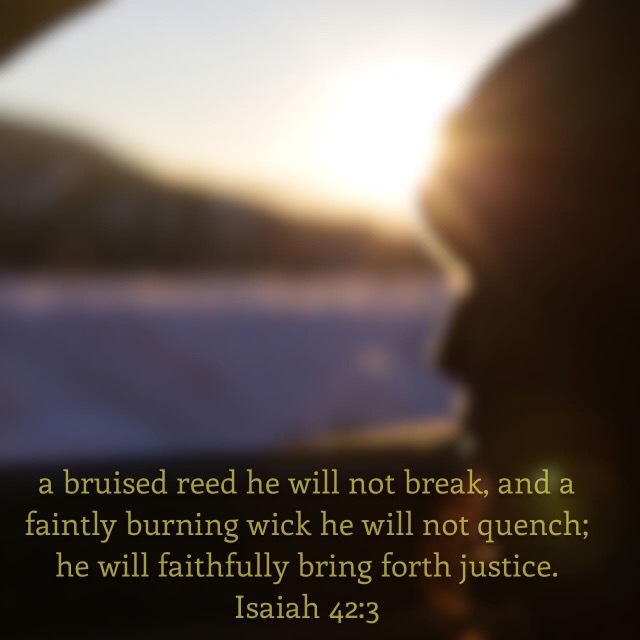 I love reading the book of Isaiah. During that dark time, this verse stood out like a beacon to me. It’s talking about Jesus, what He would do when he comes. It’s a great passage for Advent. In reality, my faith is weak. It is only His grace that keeps me. What a promise that at our weakest He won’t stomp on us! I’ve found this to be so true time & time again. People can become frustrated with our weaknesses, turn on us, blame us for them, give up on us. Jesus never will! He is compassion embodied, patience and love unending. He is hope. He is strengthen when I’m weak. He fans the flame of faintly burning wicks. He took death so He can give life. Next PostWho’s Telling The Story?